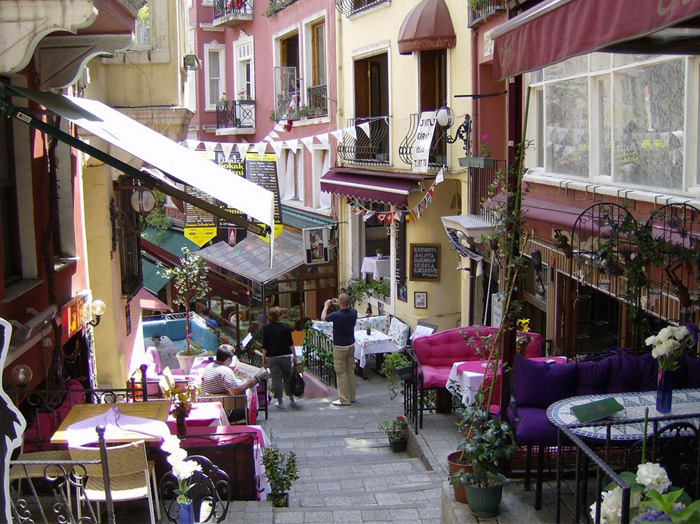 French Street brings a Frenxh atmosphere to Beyoğlu with its cafes, restaurants, wine houses and boutiques. An urban transformation project that started in 2003 gave this area a totally new identity. The abandoned Cezayir Street was gone, replaced by French Street with new pavements and pink-yellow houses with awnings. In this conceptual work, which aimed to reflect French cultural values, French architecture were heavily involved. The buildings -which dated back to the 1800s, witnessing generations of families- were restored by preserving their historical texture. Special musical systems were incorporated into the street and hundred-year-old street lamps working with coal gas were placed on the street. French Street was ready to serve, opened with a splendid ceremony. Since that day, the street has become the address for numerous cultural activities, workshops and exhibitions. The French Street is a great place to have a listen to the French chansons and it is also possible to find restaurants offering very special tastes from French cuisine. It hosts cafes, bars, wine houses along with souvenir and second-hand shops.